The Alliant International University MBA is designed for working professionals. Classes are offered in the evening at the San Diego campus. With a full course load, a student would be on campus twice a week. Students can also complete their MBA studies entirely online. 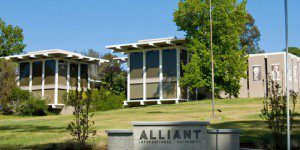 Alliant’s California School of Management & Leadership MBA students who majored in business as an undergraduate take 12 courses. Non-business majors take two additional courses, Financial and Managerial Accounting, and International Economics and Trade. Business undergraduates at Alliant can take advantage of the Direct Pathway program to accelerate their path toward an MBA. All MBA students take the same eight core classes as a cohort: International Marketing Management, Organizational Behavior and Global Leadership, Strategic Management, Statistical Analysis and Modeling for Business, Financial Management, Technology for Managerial Decision Making, Operations Management and Logistics, and Management In the New Age (Capstone). Students then choose a concentration and take four additional courses in that area. There are six concentration options, including entrepreneurship, and hospitality management. Alliant’s California School of Management & Leadership’s Career Services helps students identify the best careers for them, search for jobs, write résumés and cover letters, network, and interview effectively. For the 2018-19 academic year, tuition $698 per unit for the Alliant’s California School of Management & Leadership’s MBA. MBA students take from 36 to 42 units, making total tuition $25,128 to $29,316. Students can apply for a range of grants and scholarships, including the Alliant’s California School of Management & Leadership’s MBA Scholarship, which covers 33 percent of tuition for each semester, and the MBA Direct Path Scholarship, for undergraduate alumni of Alliant International University. The Alliant’s California School of Management & Leadership MBA uses rolling admissions deadlines, but recommends applying early.